Thunderstorms rolled through the D.C. area Friday afternoon and evening, felling trees, producing hail and triggering power outages in some parts of the region. The violent storms came just one day shy of the first anniversary of the June 29, 2012 derecho, which also swept through on a Friday evening in late June. 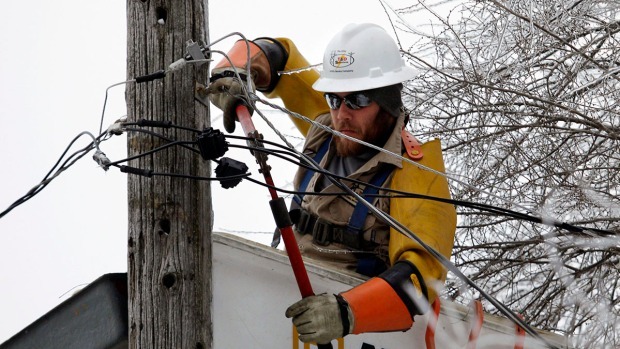 But that storm caused far worse damage and left some parts of the region without power for many days. Friday, almost three inches of rain poured down onto the D.C. area, with Reagan National Airport reporting 2.86 inches as of Friday night, said Storm Team4 Chief Meteorologist Doug Kammerer. This is already the fourth wettest June on record, with 9.69 inches of rain in D.C. so far this month. "It was raining so hard you couldn't even see the cars on 395!" wrote Megan Grimes (@ohhaymegs) on Twitter. 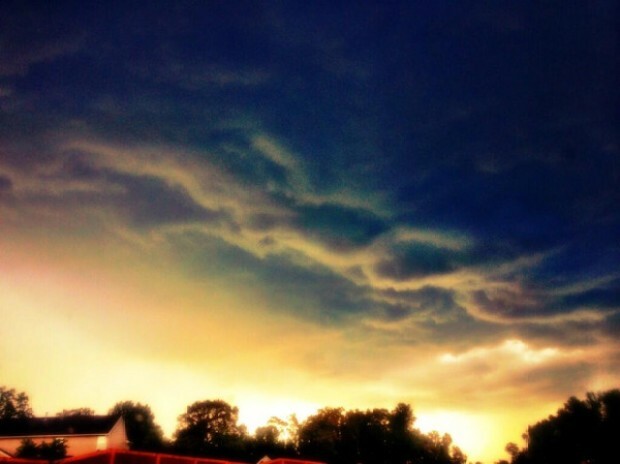 Friday evening's storms knocked trees down throughout the D.C. area. 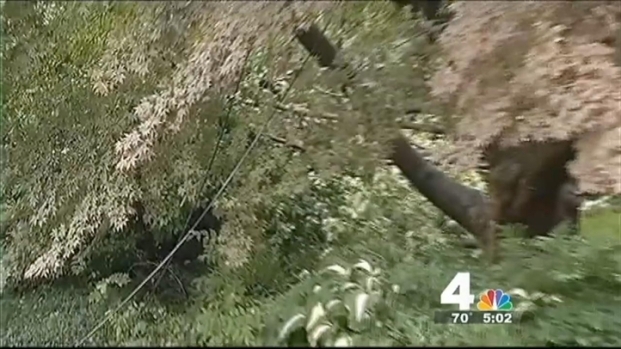 News4's Shomari Stone reports on the damage in Arlington, Va.
"There comes a moment when an umbrella is just a waste of time," tweeted Katleen Butler (@kbutler333). 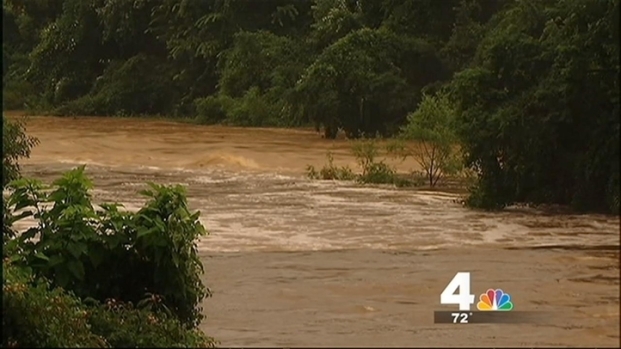 Northern Virginia seemed hardest-hit in the region. Part of the roof of a Manassas Hyundai dealership collapsed during the storm, and one woman suffered an ankle injury as she tried to escape the falling roof, according to initial reports. Trees fell in Bethesda as storms rolled through our area. News4's Shomari Stone has the latest. The damage at Browns Manassas Hyundai seemed to be caused by the weight of water on the roof. Trees were down and debris scattered throughout Arlington, reported News4's Mark Segraves. On one dark block, one family was caring for a son on life-supporting machines. The machines have battery backups -- but the family was also worried that their cell phone batteries wouldn't last. Dominion Power has made that block a priority because of the boy's condition, Segraves reported. At the height of Friday night's storm, power was knocked out to almost 40,000 Dominion Virginia customers and more than 9,000 Pepco customers. Many have since been restored, with about 1,900 Dominion Virginia customers, 100 Pepco customers, and 30 BG&E customers still without power as of noon Saturday. 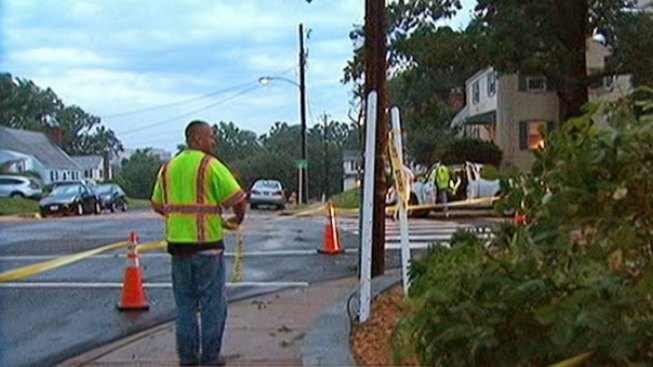 Dominion Virginia says it's working to restore power to all customers by midnight Saturday -- a quick change from a Friday night, when Arlington officials were warning residents turning the lights back on could be a "multi-day event." Friday evening, Arlington police were directing traffic through intersections where power was out. Elsewhere in Arlington, neighbors were keeping a close eye on the swollen Holmes Run, which was running with what one resident described as the most water they've seen in 10 years, reported News4's Shomari Stone. As of Friday night, no serious injuries had yet been reported due to the storm. D.C. police reported a tree down blocking the southbound lanes of Interstate 295 at Overlook Avenue SE. Urban Forestry was dispatched. Another tree fell overnight in the district, possibly as the result of a saturated ground. Authorities closed 27th SE between Naylor Road and Texas Avenue to remove it. At 8th Road S. in Arlington, a fallen tree crashed into a deck, prying it away from the house and lifting it into the air. Another tree was reported to have fallen on a car in Old Town Alexandria. Most of the severe weather warnings expired Friday evening, though the danger of floods from swollen creeks remained. A much smaller risk for storms is in the forecast for Saturday, but the risk for stormy weather returns Sunday through next week.